Peter Winter: The German Donald Hess? Peter Winter, owner of Weingut Georg Mueller Stiftung in Hattenheim in the Rheingau, had invited to a Gutsweinprobe at the Weingut. I was very much impressed by the Weingut, the cellar, the food, the wines and the art, and I was reminded of Donald Hess. Is Peter Winter the German Donald Hess? (5) Bodega Colomé in Argentina, with presumably the highest vineyard in the world at 10,200 feet/3,111 meters above sea level in the northern part of the Calchaqui Valley. 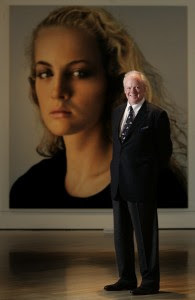 Donald Hess is also into art. His Napa Valley collection opened in 1989 in the original winery built in 1903. The Museum at the Glen Carlou Winery outside Paarl South Africa opened in 2006, and his latest passion in Bodega Colomé, not only has an art gallery but also has a stunning hotel. When you spent an afternoon at Peter Winter’s Weingut Georg Mueller Stiftung in Hattenheim in the Rheingau, you are a bit reminded of Donald Hess. Of course, it is a long, long way to go to get there were Donald Hess is now and most likely Peter Winter will never get there. But the two men appear to be on the same journey, that of wine and art. Peter Winter’s journey started in 2003, when he purchased the Weingut Georg Mueller Stiftung, at 60 – 20 years later in the lifecycle than Donald Hess. Before that turning point in life, Peter Winter was for over 40 years in various key positions in the German wine industry. Importantly, for 18 years he was the Chairman of the Board of one of the ten largest wine companies worldwide. He is also President of the German Wine Exporter Association and teaches at the University of Geisenheim. Like Donald Hess, he not only loves wine but also art and since 1987, he co-owns with his wife an art gallery in near-by Wiesbaden. Georg Müller, the co-owner of the famous Eltville sparkling wine cellar, Matheus Müller, established the Estate towards the end of the 19th century. In 1913, he donated the Estate to his home community of Hattenheim: with the stipulation to use the profits for the benefit of the needy in the community. Thus, the Wine Estate became the Georg Müller Stiftung, owned and run by the local government. Things changed dramatically in 2003, when the local government decided to privatize the Estate, which had produced good wines until the 1970s, but since then had deteriorated. Peter Winter purchased the Estate and – after many decades of a “Dornroeschenschlaf” - revived it, obviously with sizable financial investments and his enthusiasm and dynamism. Part of the credit also needs to go to Alf Ewald, the energetic young winemaker, he hired. The cellar has become in part a museum. In addition to fulfilling its traditional role as the place to stock and age wines, the cellar is also a show room for modern art. Most of the modern art exhibited in the cellar was produced specifically for the wine cellar. The climatic conditions in the cellar needed to be taken into account in creating the art. Consequently, the sculptors and painters typically worked with stone, metal, silicon or plastic and painted behind glass, Plexiglas or on MDF panels. It is a fascinating setting down there in the cellar: a large space of about 1000 m2 and 250 years old. It can be used for various purposes, including receptions and wine tastings. The Estate covers an area of approximately 12 hectares with excellent locations in the Schützenhaus, Engelmannsberg, Hassel, Wisselbrunnen and Heiligenberg vineyards. Approximately 80% is Riesling and 15% Spätburgunder. In terms of winegrowing and winemaking philosophy, Alf Ewald points out that as much as possible is done by hand. Grapevine pruning, the early removal of eyes, targeted defoliation and thinning significantly reduce quantities, which greatly increases the intensity of the aroma and the natural sweetness through a much improved leaf to fruit ratio. Soil management is based exclusively on an ecological approach. Fertilizers are avoided through the targeted use of special herbs. In the cellar, Riesling is produced in individually temperature-controlled stainless steel tanks. The red wines are matured in barrique barrels. It is important to protect the product by ensuring cool fermenting temperatures, avoiding unnecessary pumping and, first and foremost, by using the force of gravity. 25 Wines were presented at the tasting in early June 2010. These included 3 Sekts, all brut or extra brut, in the Euro 9 to 15 range. I did not see any “Literweine”, i.e. entry-level wines bottled by the liter. The George Mueller Stiftung entry-level white wine was a 2009 Riesling QbA trocken for Euro 5.95. I was very impressed by the minerality and elegance of the 2 Erstes Gewaechs wines, from the Wisselbrunnen and Schuetzenhaus Erste Lage vineyards, from 2008 and 2007, both for Euro 19.50. The Georg Mueller Stiftung wine portfolio also included 6 sweeter style white wines and 5 red wines. I liked in particular the 2007 Edition PW Spaetburgunder, with an attack of strawberries and smoked toast on the nose, a good structure and a lingering finish; a very feminine wine. Alf Ewald is the architect behind the excellent George Mueller Stiftung wines. He was awarded the “young vintner of the year” prize in 2003. In 2004, Peter Winter founded also the Peter Winter Weinkellerei, which produces wines from the Rheingau and the Rheinhessen regions. Winter’s Wein Direkt markets the wines of a handful of winemakers from France, Spain and South Africa. I joined Epifanio Rivera of Bodegas Epifanio Rivera for a tasting of his wines at Addy Bassin’s MacArthur Beverages in Washington DC. Located on the Iberian Peninsula, Spain has over 2.9 million acres (over 1.17 million hectares) planted. It is with Italy and France in the leading trio of wine producing nations. In terms of consumption, Spain is 9th worldwide with Spaniards drinking, on average, 10.06 gallons (38 liters) a year. Wine growing and making began many centuries ago, even log before the Romans came. During the Roman Empire, Spanish wine was widely exported and traded. Following the decline of the Roman Empire, under the Moors, Islamic dietary laws that forbid the use of alcohol, prevailed. In the wake of the Spanish Reconquista in 1492, Bilbao emerged as a large trading port. Spanish wines became popular in England. Christopher Columbus discovered the New World under the sponsorship of the Spanish crown. This opened up a new export market as well as new opportunity for wine production. Spanish missionaries and conquistadors brought European grape vines with them. During this period, Spanish wine exports to England began to wane as Spanish-English relations steadily deteriorated following the divorce of Henry VIII of England from his Spanish wife Catherine of Aragon. The 17th and 18th centuries saw periods of popularity for various Spanish wines-namely Sherry, Malaga and Rioja wine. A major turning point occurred in the mid 19th century when the phylloxera epidemic ravaged European vineyards-most notably those of France. With the sudden shortage of French wine, many countries turned to Spain. Phylloxera eventually reached Spain, devastating regions like Malaga in 1878 and reaching Rioja in 1901. But by the time the Spanish wine industry felt the full force of phylloxera, the remedy of grafting American rootstock to the European vines had already been discovered and widely utilized. The end of the 19th century also saw the emergence of Spain's sparkling wine industry with the development of Cava in Catalonia. The late 1970s and 1980s saw periods of modernization and renewed emphasis on quality wine production. Spain's reputation entering the 21st century was that of a serious wine producing country that could compete with other producers in the world wine market. • Vino de Mesa (VdM) - These are wines that are the equivalent of most country's table wines. • Vinos de la Tierra (VdlT) - This level is similar to France's vin de pays system, normally corresponding to the larger comunidad autonóma geographical regions and will appear on the label with these broader geographical designations like Andalucia, Castilla La Mancha and Levante. • Vino de Calidad Producido en Región Determinada (VCPRD) - This level is similar to France's Vin Délimité de Qualité Supérieure (VDQS) system and is considered a stepping stone towards DO status. • Denominación de Origen (Denominació d'Origen in Catalan - DO)- This level is for the mainstream quality-wine regions which are regulated by the Consejo Regulador who is also responsible for marketing the wines of that DO. Nearly two thirds of the total vineyard area in Spain is within the boundaries a DO region. • Denominación de Origen Calificada (DOCa/DOQ - Denominació d'Origen Qualificada in Catalan)- This designation, which is similar to Italy's Denominazione di Origine Controllata e Garantita (DOCG) designation, is for regions with a track record of consistent quality and is meant to be a step above DO level. Rioja was the first region afforded this designation in 1991 and was followed by Priorat in 2003, and Ribera del Duero in 2008. • Crianza red wines are aged for 2 years with at least 6 months in oak. Crianza whites and rosés must be aged for at least 1 year with at least 6 months in oak. • Reserva red wines are aged for at least 3 years with at least 1 year in oak. Reserva whites and rosés must be aged for at least 2 years with at least 6 months in oak. • Gran Reserva wines typically appear in above average vintages with the red wines requiring at least 5 years aging, 18 months of which in oak. Gran Reserva whites and rosés must be aged for at least 4 years with at least 6 months in oak. The country has an abundance of native grape varieties, with over 600 varieties planted throughout Spain though 80 percent of the country's wine production is from only 20 grapes—including Tempranillo, Albariño, Garnacha, Palomino, Airen, Macabeo, Parellada, Xarel•lo, Cariñena and Monastrell. Tempranillo is the second most widely planted grape in Spain and is an important grape in the Rioja, Ribera del Duero and Penedès regions. The most widely planted grape is the white wine grape Airén, served as the base for Spanish brandy. Sherry is a fortified wine produced in southern Spain. It can either be sweet or dry, unlike Port. Port wine is made sweet by adding alcohol to the fermenting must so the fermentation stops and the sugar of the grapes remains in the wine. What you get is a wine with lots of alcohol and remaining sweetness in the wine. Sherry, on the other hand is made by letting the fermentation go its full way so that a dry wine emerges. Then, alcohol is added to boost the alcohol level. If the winemaker stops there, you get a dry Sherry. If he also adds sterilized juice, you get a sweet Sherry. Thus, Sherry can be sweet or dry. Ribera del Duero is one of several wine-producing regions along the Duero river. It is home to the world-famous Vega Sicilia and Tinto Pesquera wines. The Denominación de Origen of Ribera del Duero was established in 1982 and upgraded to Denominación de Origen Calificada (DOCa) in 2008, which made it Spain's third DOCa after Rioja and Priorat. Wines in the Ribera del Duero DOCa are almost exclusively from red grapes. The Albillo grape is the only white variety grown, mostly destined for local consumption. The vast majority of production is dedicated to Tinto Fino (the local name for Tempranillo). Bodegas Epifanio Rivera, established by the Rivera-Aparicio family, is an old Bodega. The ancient underground cellar dates from the 16th century. All the vineyards are located in the Pesquera de Duero. The vineyards total over 20 hectares. Some of the vineyards are over 80 years old. The new winery has a capacity for 100,000 bottles. The harvesting is done by hand; the grapes are collected in boxes of 20 kilograms to ensure a careful selection. Fermentation is done with strict temperature control. The tanks are shallow and very wide in order to extract the best tannin. The chambers where barrels and bottles are placed for ageing are thermally controlled, so as to accurately reproduce the conditions in the old underground wine cellars. Erial is made from 100% Tinta Fina. Ageing in barrels, of which 80% are French oak and 20% are American oak, is 10 months. Lively and colorful wine that is open and clear in the nose; with sterling mature blackberries, black liquorice, and mineral reminiscences; with creamy and smoky tones from the oak wood; and a spicy finish. Neatly structured in the mouth, with friendly and well-melted tannin, beefy and concentrated fruit, extremely tasteful, balanced and with a refreshing sensation due to an appropriate acidity. Erial Tradicion Familia Rivera-Aparicio (Erial TF) is aged for 16 months in oak barrels consisting of French oak (85%) and American oak (15%) and is designed with a different selection of grapes than Erial. The source of the grapes are 80 years old vines located in Pesquera de Duero area. It is 100% Tempranillo grape variety. The color is deep purple, bright and clean. The nose is very intense with lots of ripe fruits such as plums and figs, balsamic and spice aromas such as eucalyptus, clove, white pepper, and black ink. Very complex and well integrated with the oak. On the palate is concentrated and long. Great balance between fruit, acidity and silky tannins. Walter Schug is a celebrated winemaker in California with German roots. He is in particular known for being a California Pinot Noir pioneer. His home is Walter Schug Carneros Estate winery in Sonoma, California, but he was born and grew up in Assmannshausen in the Rheingau in Germany. He also received his formal training as winemaker in Germany. Walter Schug first made Pinot Noir in 1954, with his father in Assmannshausen in the Rheingau. The Rheingau is known throughout the world for its outstanding Rieslings. But at the western edge of the Rheingau is a little enclave that never has produced Riesling but always has been known for its outstanding Pinot Noir wines. This is Assmannshausen, the home town of Walter Schug. The Rheingau, although with 3125 hectares making up only 3 percent of the total German vineyard area, has seen of many historically important events in German wine making, like the production of the first late harvest wine, and contains many well-known wine producers. It boasts a higher proportion of Riesling (78.8%) than any other German wine-growing region, with Spätburgunder (Pinot noir) accounting for most of the rest. In the US, Pinot Noir shows best in Oregon and California, thanks to pioneers like Walter Schug. The reputation that gets Pinot Noir so much attention, however, is owed to the wines of the Bourgogne in France, where it has probably been cultivated since at least the 4th century. Regardless of where it’s grown, Pinot Noir is not typically a value wine. That is so because Pinot Noir is such a delicate grape that it is difficult and expensive to grow and make into the spectacular wine it can be. It is sensitive to climate and soil, Pinot Noir needs warmth (but not intense heat) to thrive and does well in chalky soils. As the German name implies, it ripens late (spät). 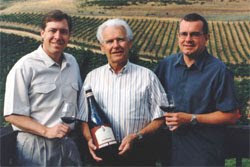 Walter Schug was born in Germany in 1935 on the grounds of the Staatsweingut Assmannshausen, a government-owned top German Pinot Noir Estate. His father was the General Manager there and Walter spent his youth working beside his father in the winery and vineyards. He got his formal training as winemaker at the Geisenheim College, just a few miles away from Assmannshausen, where he graduated in 1954. He then worked at several German wine estates before coming to California in 1959 with his late wife Gertrud, also from a prominent wine family, in the Pfalz region. Walter Schug was the first winemaker at Joseph Phelps in 1973, where he initially built a reputation for Riesling and Cabernet Sauvignon. He also made the first post-Prohibition Syrah at Phelps. The much sought-after Insignia, a proprietary Bordeaux-blend, is another of Walter’s winemaking achievements, when he worked at Joseph Phelps. In 1980, Joseph Phelps decided to discontinue Pinot Poir. Walter, with his passion for Pinot Noir, decided to craft his own version of Pinot Noir under his own name and left Joseph Phelps in 1983. 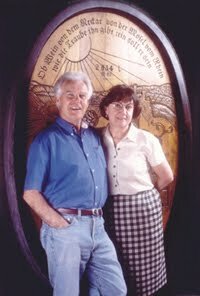 Initially, Walter and Gertrud Schug leased a winery in Napa Valley. In 1989, Walter and Gertud purchased 50 acres in the Sonoma portion of the Carneros Appellation, began to plant the vineyards and laid the cornerstone for their new Carneros Estate that is the heart of the business today. As the family business grew, each of Walter and Gertrud’s 3 children contributed to the winery business at some point. Daughter Andrea used her CPA training to provide financial advice during the early years of operation; twin sister Claudia moved to Germany and set up Schuetz Weinimport. 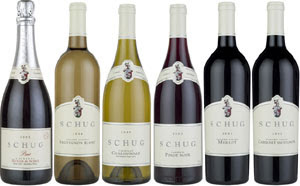 She now imports Schug wines and distributes them throughout Europe. After an initial career working in hotels, Axel Schug joined the winery at age 25 and became Sales and Marketing Director, based in the Carneros offices. Axel is currently the Managing Partner for the Walter Schug Carneros Estate and Axel’s wife, Kristine Schug, is the Winery Chef. Sadly, Gertrud Schug passed away in 2007. With Michael Cox on board as winemaker, Walter now holds the title of Winemaster Emeritus and uses his experience of more than half a century to provide guidance to the Schug team. The Schug team is very concerned with finding the most environmentally friendly and efficient way of growing the grapes. Cover crop is an important part of the yearly cycle. In the Spring, carpets of mustard flowers, California poppies and wild grasses cover the ground between the vines. Not only does this transform the vineyards into a colorful patchwork, but the benefits also include prevention of soil erosion, nitrogen addition, soil structure improvement, weed suppression and creating a habitat for beneficial insects. In addition, it reduces the vineyard work load, fuel use, and the necessity for pesticides. The winery itself is constructed in a post-and-beam architectural style that reflects the Schug family's roots in the Rheingau. But here, you could see San Francisco Bay from the hilltop. The Carneros District lies at the south end of both the Napa and Sonoma valleys. An area of low hills and flat lands, the region is profoundly affected by cool marine air from the bay and Pacific Ocean. During the summer, a ceiling of fog hovers over the Carneros vineyards in the morning, burning off as the day goes on. Specifically on the Schug Estate, the fog is replaced at midday by summertime winds that come rushing through what is known as the Petaluma Gap, a break between two mountains which creates a kind of wind-tunnel across the vineyards. The wind stress causes the skin of the grapes to thicken, particularly the higher Pinot Noir plantings, a characteristic that adds pepper and spice nuances to the wine. Sonoma Valley is home to some of the earliest vineyards and wineries in California. The Franciscan missionaries led the way, bringing the Mission grape to make wines for religious services. Cradled between the Mayacamas and the Sonoma Mountain ranges, Sonoma Valley encompasses a rolling patchwork of vineyards, quaint farms and 13,000 acres of scenic parkland, with many famous wineries. One of them is the Walter Schug Carneros Estate, which has its roots in the Rheingau in Germany. The Wines of Duckhorn Vineyards, Napa Valley. In Germany, there are three influential wine guides, the Eichelmann, the Gault Millau and the Feinschmecker. The 2010 Awards of the Gault Millau went to Tim Froehlich, the Estate of Baron Gleichenstein and Eva Vollmer. Wine maker of the year: Tim Fröhlich from Weingut Schäfer-Fröhlich. The "Winemaker of the Year" this time comes from the Nahe region, a small region between the Rheingau and the Mosel regions, with the Nahe river flowing through it. Tim Frohlich took over Weingut Schäfer-Fröhlich in 1995. Shooting star of the year: Gleichenstein Estate from Baden. The Estate of Baron Gleichenstein has founded in 1634 already. But only in recent years the estate has taken off under the young Baron Johannes von Gleichenstein. Discovery of the Year: Eva Vollmer from Rheinhessen. I met Eva Vollmer recently in Mainz at the Mainzer Marktfruehstueck (Mainz Market Breakfast), where she poured her wines. Eva Vollmer is the 2010 Gault Millau Germany Wine Guide Discovery of the Year. She owns and operates - jointly with her partner in live Robert Wagner - a new Wine Estate in Rheinhessen in the outskirts of Mainz. After studies in Geisenheim and an internship in California at Wlliam Hill and Atlas Peak, she founded the winery in 2007. She took over the vineyards of her father, who used to grow grapes only and sell them. Since then, she has not only produced outstanding wines , but also completed a Masters at the University of Giessen and is currently working on a doctorate. The very first vintage in 2007 was Eva Vollmer’s big bang on the national wine stage. Only just under 5,000 bottles were filled from the first vintage. Wine Estate Eva Vollmer is in the process of moving to organic wine growing. Rheinhessen is an area that used to be known for winemakers often focusing on quantity and not quality. Rheinhessen is the largest viticultural region in Germany. Every fourth bottle of German wine comes from Rheinhessen. The high-yielder Mueller-Thurgau accounts for about 1/5 of the vineyards. Unlike in other German wine regions, where monoculture of the vine is the norm, here the many rolling hills are host to a wide variety of crops grown alongside the grape. Rheinhessen also has the rather dubious honor of being considered the birthplace of Liebfraumilch. At the same time, Rheinhessen is among Germany’s most interesting wine regions. A lot is happening there. This is not because of the terroir, but because of the people. There is an increasing group of mostly young and ambitious winemakers who want to produce and indeed do produce outstanding wine and not wines in large quantities. Eva Vollmer is one of them. Along with other winemakers, Eva is moving away from the classical German wine classification and has established her own quality standards. She groups her wines into 3 categories: Gutswein, Ortswein and Lagenwein, in line with the new VDP classification. All wines, by law, need to be classified according to the 1971 German Wine Law. All Eva Vollmer wines are classified as QbA, regardless of the Oechsle at harvest and thus they can be chaptalized. The QbA on the label is meaningless. Gutswein: These wines are intended for everyday consumption: uncomplicated, fresh and timulating. To guide the consumer, there is a dot behind the grape variety, for example, Silvaner..
Premiumwein: The wines of this line are complex and an ideal dinner companion. There is an exclamation point behind the grape, for example, Silvaner!. Kultwein: Eva Vollmer’s top wines from top vineyards (Hüttberg and Böckhohl) with old vines. o help the consumer, there is a exclamation mark after the vineyard on the label, for example, Böckhohl!. The Eva Vollmer wine portfolio comprises Silvaner, Scheurebe, Weißburgunder and Riesling white wines and Dornfelder und Spätburgunder red wines. There are currently about a dozent wines or so on the wine list, with prices starting at Euro 5.50 for a Silvaner. Trocken Gutswein up to a Dornfelder! Barrique for Euro 10. The wine portfolio also contains an excellent Weissburgunder! Sekt brut for Euro 9.30. I met Brian Talley, leader of Talley Vineyards, one of the California Central Coast's exciting wineries at Cecile’s in McLean. The California Central Coast roughly spans the area between the Monterey Bay and Point Conception. It extends through Santa Cruz County, San Benito County, Monterey County, San Luis Obispo County, and Santa Barbara County. The area is not densely populated. The largest city in the region is Salinas, with approximately 150,000 people. 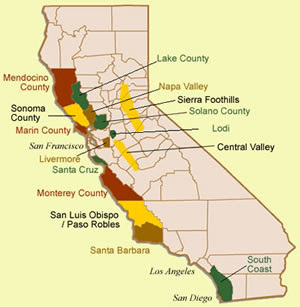 California's Central Coast is a prime wine-grape growing region and home to more than 100 wineries. Most of the wineries are located near major highways and offer spectacular vistas of valley and mountains. The California Central Coast wineries have built on a century-old tradition started by Franciscan friars, who planted the earliest vineyards on the Central Coast. Even so, it has been in just the past several decades that wine-growing and producing has come into its own on the Central Coast. While bear hunting south of San Luis Obispo in 1826, Francis Ziba Branch discovered a clearing with breathtaking views. Though it was an impassable swamp at the time, Branch envisioned the potential of the land. Eleven years later, Branch was granted 16,985 acres by the Mexican government and settled his wife Manuela and son Ramon into Rancho Santa Manuela. The Biddle family bought much of Rancho Santa Manuela in 1879 and continued to run a successful cattle ranch. The Talley family leased part of the Biddle family’s premium farmland in the 1948 and established Talley Farms. Over the years, the Talley family purchased and cultivated other pieces of the land. Talley Farms is now a diversified family farming company recognized as one of the nation’s premier growers of vegetables, wine grapes, lemons, and avocados. Talley Vineyards was founded in 1986 by Oliver’s son Don and Rosemary Talley. The winery is now one of California’s acclaimed producers of Chardonnay and Pinot Noir. Wines are produced under the Talley Vineyards and Bishop’s Peak brands from over 200 acres of vineyards of the Talley family’s six vineyard sites in two valleys. The winery's first five vintages were produced in a small winery adjacent to one of Talley Farms' vegetable coolers. In the fall of 1991, a state-of-the-art winery was completed at the foot of the Rincon Vineyard. This 8,500 square foot facility was designed with one goal in mind: to maximize the influence of the vineyard through minimal processing of the grapes into wine. Winery features include a total gravity system for crushing, so that grapes are handled as gently as possible, and an extensive cooling and humidity system to maintain ideal conditions during barrel fermentation and aging. A 12,000 square foot barrel and case goods storage building was added in 2000, followed by a new tasting room in 2002. Talley Vineyards currently produces about 18,000 cases annually. High quality and long-term sustainability are the two principles that guide Talley Vineyards' farming decisions. Brian Talley and Vineyard Manager Kevin Wilkinson collaborate to constantly strive to improve fruit quality while ensuring that the techniques employed work in harmony with the natural conditions of the individual vineyard sites. Biologically based farming techniques and integrated pest management practices are employed throughout the vineyards. To improve soil conditions, prevent erosion and provide fertility, cover crops are maintained in all vineyard blocks. Compost produced from a combination of the winery's grape pomace and horse manure is another key source of fertility. The growing of premium wine grapes is highly labor intensive, especially the functions of pruning, shoot thinning, canopy management and harvest. All of these functions are performed by hand with full-time, year-round employees who are paid by the hour to ensure the highest possible quality. This is unique in California where most grape growers employ labor contractors seasonally, pay their workers on a piece-rate basis and increasingly rely on mechanized pruning and harvesting. Shoot thinning and leaf and lateral shoot removal are employed throughout the vineyards to open the vine canopy and expose the grapes to more air and sunlight. This prevents powdery mildew and botrytis, two common problems in the cool foggy conditions typical in the coastal area, while promoting more even ripening of the fruit. All grapes are carefully hand harvested during the cool hours of the morning, between 4AM and 9AM, and taken a short distance to the winery where they are immediately sorted and processed. The Chardonnay is cluster sorted and whole cluster pressed. The juice is only minimally settled in tank and then racked into medium-heavy toasted French oak barrels from the Allier and Vosges forests. The level of new oak used depends on the wine, but generally ranges between 25% and 35%. All of the wine is barrel fermented with various cultured yeast strains as well as native yeasts. Maximum fermentation temperatures are cool and range from 68°-74°F to preserve the natural fruit characteristics of the wine. As is traditional in Burgundy, all of the wine ages sur lie and undergoes malolactic fermentation to soften the natural acidity while adding richness and complexity to the finished wine. The Estate and Oliver's Vineyard chardonnays are typically bottled after 11 months in barrel, while the Rincon Vineyard and Rosemary's Vineyard wines age 14-16 months in barrel. After cluster sorting, the Pinot Noir is predominantly destemmed, though 25% whole clusters are maintained in vineyard blocks that achieve good stem lignification. Destemmed grapes are berry sorted before they are gravity fed into small open top fermenters. Before fermentation, the must undergoes a "cold soak" of three to five days to extract color, aroma, and flavor. Only native yeasts ferment the Pinot Noir, with the objective being a long, slow fermentation. Maximum fermentation temperatures range from 85°-92° F. After a cuvaison of about ten days, the wine is racked, with minimal settling, into medium-heavy toasted Allier and Vosges barrels where it ages for 15-18 months before bottling. Generally 30-40% of the barrels are new. Bishop's Peak Chardonnay 2007: crystal clear Central Coast fruit. Bishop's Peak Pinot Noir 2008: juicy, fresh, and very easy to drink. Talley Vineyards Chardonnay Estate 2008: bright and energetic with nice complexity on the back. The VDP, founded in 1910, is the world’s oldest association of top-quality wine estates. Nearly 200 wine estates from all German wine-growing regions belong to the VDP today. They cultivate about four percent of Germany’s vineyard area. Membership in the VDP requires voluntary adherence to “in-house” quality criteria that exceed the minimums prescribed by the German wine law of 1971. The top level: ERSTE LAGE: Wines from the best vineyards of Germany; dry wines are designated Grosses Gewächs and Erstes Gewächs (Rheingau region); sweet wines are denoted by the traditional Prädikats. Conditions: A site’s absolutely finest, narrowly demarcated parcels with discernible terroir qualities. Designated grape varieties and taste profiles. Maximum yield of 50hl/ha. Selective harvesting by hand. Minimum must weight equivalent to Spätlese. The second level: KLASSIFIZIERTE LAGE / ORTSWEIN / TERROIRWEIN: Only wines from classified sites of superior quality bear the name of a vineyard. Conditons: Classified sites compromise a select, small group of traditional vineyards that have a distinctive character. This constitutes a fraction of the multitude of vineyard names permitted by law. Maximum yield of 65hl/ha. Designated grape varieties and minimum must weight are determined by regional VDP associations. The lowest level: GUTSWEIN: High-quality wines that reflect regional character. Conditons: At least 80% of an estate’s holdings must be planted with traditional grape varieties typical of their region, as recommended by the VDP. Maximum yield 75hl/ha. Minimum must weight (higher than prescribed by law) is determined by the regional associations. Further, as a major development, the VDP members have dropped the traditional Praedikats for dry wine. German wine up to Spaetlese and Auslese can be bone-dry or sweet, depending on what the winemaker wants. The terms Spaetlese and Auslese, however, seem to suggest to consumers that this are sweet wines. Yet, they can be bone dry. This has led to a lot of confusion. In view of that, the VDP members have started to market all dry wines as Qualitateswein, QbA, regardless of the sugar level of the fruit at the point of harvest. Only wines that have a noticeable level of sweetness carry the traditional Praedikats like Spaetlese or Auslese. Thus, if you see Spaetlese on the label of a VDP member wine, you can be sure that it is a sweet Spaetlese. The label with “Spaetlese trocken” does not exist anymore among the VDP members. If it is a wine at Spaetlese level and fully fermented to complete dryness, it would be marketed as QbA wine. And the level of quality would be indicated by the terroir definition dicussed above. ECOVIN is an association of winegrowers in Germany whose nearly 200 members with 1.000 ha vineyards are practicing organic viticulture according. To date about one percent of viticulturists in Germany produce wine according the ECOVIN-guideline. Lotte Pfeiffer-Mueller, co-owner of Weingut Brueder Dr. Becker, is the Chairwoman of the Board of ECONVIN. The following discusses the organic winegrowing and other green concept(s). Carbon footprint: The carbon neutral label comes from a different angle: global warming. All economic activites have a carbon footprint, including wine making. Carbon neutral wineries are trying to make a contribution to the general efforts of reducing the emission of carbon dioxide. The Muellers have about 40 wines on their wine list. 3 of the 4 Liter wines are dry and the Scheurebe Liter wine is medium-sweet. The Riesling Liter wine costs Euro 6. There is the whole range of Scheurebe wines from the medium-sweet Liter wine to an amazing 1999 Scheurebe Trockenbeerenauslese for Euro 45. In addition, I found a delicious Scheurebe Sekt on the list for Euro 9.80, also medium-sweet. About half of the wines are dry. The overwhelming majority of the wines is white, with Riesling dominating. 3 Grosses Gewaechs wines from the vineyards Tafelstein and Falkenberg stand out, for Euro 18 to 19. The wine list also includes 3 noble sweet wines, including the already mentioned Scheurebe Torckenbeerenauslese, and 4 sweet Auslese wines. Brüder Dr. Becker 2007, Dienheim, Scheurebe, Spaetlese, notes of apple, peach and honey on the nose, a medium-bodied wine, lime and grapefruit on the palate, very floral, good balance, Euro 9. La Cremerie is a fascinating little place on the Left Bank near Odeon and Bd St Germain, right in the center of the Quartier Latin, owned and managed by Serge and Helene Mathieu. They sell and pour natural wines and serve small plates of exceptional artisanal charcuterie and cheeses, but also oysters, foie gras, and smoked tuna. La Crèmerie began its life in 1880 as a dairy, and the interiors remain unchanged today – counters made of slabs of marble, ancient wooden fridges, a fabulous pastel ceiling fresco painted on silk. In 1947, it became a cave à vins and, three years ago, Serge and Helene took over. It is a small place, just enough room for 12 people to sit down, plus four stools at the bar. There is no kitchen for hot dishes. The concept of the place is to be both a wine bar and a wine store. You can walk in, choose a bottle, pay and walk away. You can also drink a glass from the (limited) wine-by-the-glass selection, or buy a bottle from the shelves, pay an extra 10 Euro corkage fee and drink it there. When I was there, it was Serge’s turn. Born in New York, Serge lived all his life in France and is an architect by training. He discovered the “green” wines, loved them and decided to make a profession of that love. I did not meet Helene. She is also an architect. Serge and Helene have four children. There are about 200 wines, mostly in the Euro 6 to 15 range. But I also saw wines for up to Euro 250. All French regions are represented, with the emphasis on Loire and Burgundy. All wines are artisanal wines from small growers. And all the wines are natural wines. There are different concepts of “green wines”. Natural wines is just one of them. Several Saucissons and Jambons hang over the counter, from France and Spain. La cremerie serves small plates of exceptional artisanal charcuterie and cheeses, but also oysters, foie gras, and smoked tuna. The red-bright ham-slicing machine on the counter is a venerable Berkel made in the year 1936. The Berkel company was at the time based in Rotterdam, Holland. C'est aujourd'hui de l'avis de tous, un lieu unique, chaleureux et convivial où il fait bon s'arrêter pour y déguster des vins hors du commun, accompagnés de salaisons et de fromages. Dégustations sur place le soir du mardi au samedi (17h30 à 22h00), le midi vendredi et samedi (13h00 à 14h30). Vente à emporter de vin, alcools et épicerie : mardi à samedi de 10h00 à 22h00 - dimanche de 11h00 à 14h30 - lundi de 14h00 à 20h00. NB : Réservations uniquement à partir de 19h30 pour le repas du soir (du mardi au samedi) et les vendredis et samedis pour le déjeuner à partir de 13h00. Aucune réservation de 17h00 à 19h30.